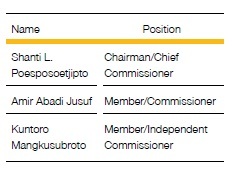 Corporate governance structure made up of General Meeting of Shareholders (AGM), the Board of Commissioners and the Board of Directors refers to the Law of the Republic of Indonesia Number 40 of 2007 on Limited Liability Companies. The three authorities elements of the Company are set out in the Articles of Association of the Company. In particular, the AGM has the full authority not shared by the other constituents. The shareholders are entitled to voicing their opinions and contributingto the decision making process and strategic matters. 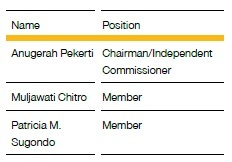 In carrying out their task, the Audit Committee follows Audit Committee Charter of PT Samudera Indonesia Tbk. The Board of Directors is fully responsible for the achievement and safeguarding of The Company’s interests and objectives in accordance with the provisions of the Articles of Association. The Board of Directors is responsible collectively in managing the Company in order to generate benefit and ensure business continuity. The term of office of every member of The Board of Directors is set for 5 (five) years and may be reappointed. The Company’s Board of Directors consists of three directors to include 1 (one) President Director, 1 (one) Director, and 1 (one) Independent Director.